Use this macro to filter the pivot table source data when you double-click a value cell. Prevents Excel from adding Show Details sheets, and makes it easy to update specific records, if necessary. Thanks to Héctor Miguel Orozco Díaz, who developed this macro. When you double-click a data cell in an Excel pivot table, a new worksheet is created, with the related records from the source data. That is a Pivot Table's Show Details command, and if you use it too often, your workbook can fill up with extra sheets. Instead of creating new sheets, this Pivot Table Data Filter Macro gives you another option. This macro applies a filter to the source data, based on the pivot items connected to the double-clicked cell. NOTE: The macro works for Excel pivot tables that are based on a worksheet list in the same workbook . The Pivot Table Data Filter Macro runs automatically when a pivot table value is clicked. On the worksheet with the source data, the records are filtered for Class_A, Month_3, Store_1, Code_A. You could update any of those records, if necessary. Then go back to the pivot table, and refresh it, to see the updated results. The following code filters the Excel pivot table source data if a data cell in the pivot table was double clicked. Copy this code, and paste it into a regular code module. Or, download the sample workbook, and copy the code from there. MsgBox "ActiveCell is @ the Bottom-Right End of Pivot Table !!!" The following code is stored in the worksheet module for the Excel pivot table worksheet. This is an event procedure that runs automatically when a cell on the worksheet is double-clicked. Paste the code where the cursor is flashing. There are two versions of the code, so download either file, or both. The zipped files are in xlsm format, and contain macros. 2. 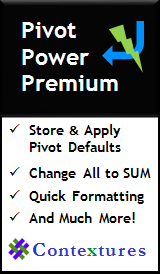 For a shorter version of the code, download the zipped Filter Excel Pivot Table Source Data sample file - Short.